FILE - A visually impaired Palestinian student attends a lesson at a school, where the pupils are taught English through song and music, in the West Bank city of Hebron, March 2, 2016. Palestinian students at a school for the blind in the West Bank are learning English through song, a welcome departure from using Braille and memorizing grammar rules. Imagine that you could not see. Or hear. And that you were just a child. What would your world be like? How would you communicate? Who would teach you to speak, to sign or to read Braille? To play? For more than 6 million children around the world, many in developing countries, this is their reality. Experts say the overwhelming majority of children with multiple disabilities are falling through the education system. "These children for the most part don't get an education — something on the order of 90 percent," said Dave Power, president and chief executive officer of Perkins School for the Blind in Watertown, Massachusetts, the United States' oldest academic institution serving blind, deaf-blind and low-vision students. Children with these disabilities have tremendous potential, he and other educators say, but they need the right education to realize it. "The stigma and discrimination that exists around disabilities — it is the attitudinal barrier — it has a wide-ranging impact," said Gopal Mitra, senior adviser on disabilities at UNICEF, the U.N. Children's Fund. Another hurdle is the availability of resources from governments and within families, which often means educating a disabled child becomes a lower priority. "Within the family, often parents do not see the value of educating the child who cannot see or cannot hear," Mitra said. There also is a general lack of programs to provide teachers with the specialized training required for teaching children with visual or hearing impairments. "I think that the greatest challenge across the world is to get the government involved in the need for teacher training," said educator Roseanne Silberman. "Even talking about being hungry, being thirsty, wanting to go to the bathroom, if you are in pain or in discomfort — our kids have no way of expressing it without having teachers who are expert in teaching communications skills." 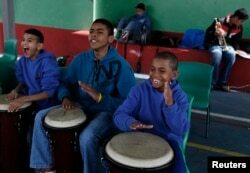 FILE - From left, students Joao Farias Alves, 11, Antonio Marques, 16, and Joao Pedro dos Santos Teixeira, 11, play bongos during their music class at the Madre Lucie Bray Municipal School for the Deaf in Sao Paulo, Sept. 4, 2012. The technique of teaching music to deaf children was developed by Fabio Bonvenuto while working in this public school in 2005, where the percussionists feel the music through vibrations rather than sound waves. Depriving an entire part of the population of vital life skills ultimately has a negative impact on society, advocates say. "Human capital is the most precious, most important resource any community has," said Juan José Gómez Camacho, Mexico's U.N. ambassador and an advocate for persons with disabilities. "What we are doing by not investing and educating young children with any kind of disability or visual impairment or blindness, we are not only depriving them of means to live meaningful lives, but countries and communities are depriving themselves from thriving members of society that can contribute enormously." This week at the United Nations on the sidelines of meetings for the Convention on the Rights of Persons with Disabilities, Perkins School for the Blind announced that it is launching an initiative to close this gap by training 1 million teachers worldwide by 2030 to educate children with multiple disabilities. "We want to do that in a way that supports teachers who are in public schools and teachers that are in special schools, so all children will have a quality education," said Michael Delaney, executive director of Perkins International. He said the program, which will have three different course levels ranging from two days to nine months, would train teachers to an international standard. "We feel that we can get more people out there — better educators, better policymakers, better programmers — that are going to be able to make a change in their societies," he added. FILE - Ellis Hall, right, a rhythm-and-blues singer and an alumnus of the Perkins School for the Blind, rehearses with the Perkins Chorus, made up of visually impaired and blind students, for the school's annual gala in Watertown, Mass., May 7, 2015. The Perkins school has a history of training teachers from other countries so they can go home and work with blind, deaf-blind and low-vision children. Now, Power said, they want to standardize that approach so they can have a wider reach. "Because we already have the knowledge and know-how and have done it, we can do it very efficiently," Power said. The school expects to fund the program through a combination of government and philanthropic support. Maricar Marquez was born deaf and at age 7 was diagnosed with Usher syndrome, an inherited condition that causes progressive vision loss. Today she is deaf-blind. She also has an older sister with the same condition. Born in the Philippines, Marquez moved with her family to Canada, where both girls received specialized education. Marquez has defied stigmas that people with disabilities cannot learn. She earned a master's degree, is married, works at a national center for deaf-blind youth and is a marathon runner, triathlete and skydiver. "I am a very different person than anyone thought when I was younger," she said through a sign language interpreter. "And had I not gotten the services that I did, I would not be where I am."